Welcome to this week's Funday Friday Challenge! We are spicing things up a bit. This week's challenge is being hosted by fellow DT member Amanda. She has chosen the theme of Autumn. I must admit I had a bit of a challenge here on the theme because it's still very hot here! I decided to go with some fall colors. 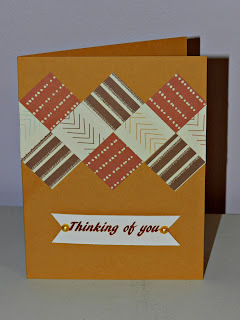 I chose pattern papers from an old Recollection Night and Fall stack. I followed a sketch I from Operation Write Home Virtual Card Making Party last week. Great combo of papers! Like the sketch you used. What a great combo of fall papers Candice! I love the colors in them and they all go so well together! Love the sketch design too!! Hugs! Love these colors you chose, and especially like the patchwork motif you have going on with the squares. (Seminole quilting pattern! and so very pretty in these colors). TFS such a lovely card.